Origin and Habitat: Mexico. 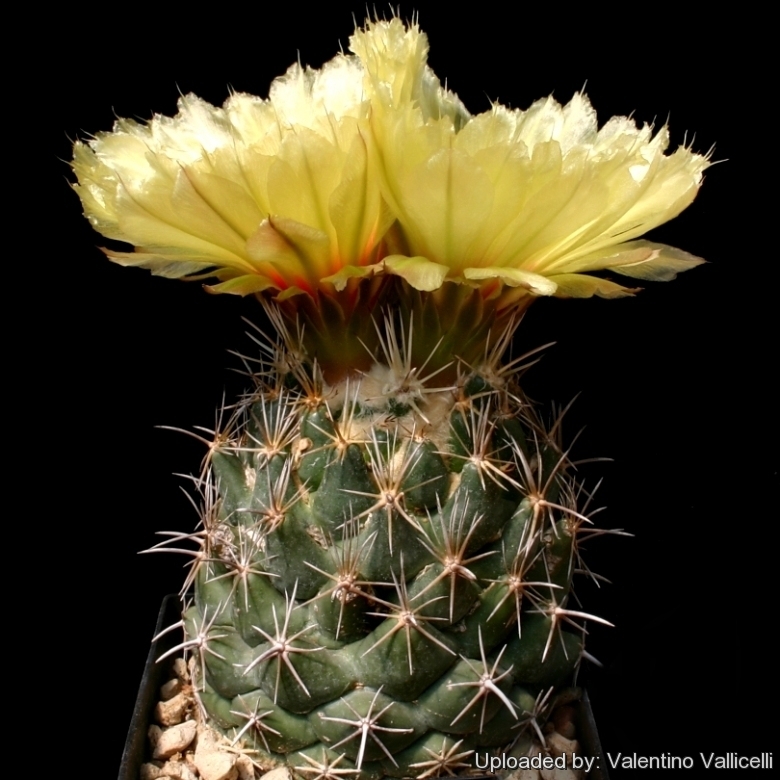 Coryphantha salinensis has an extent of occurrence well over 20,000 km, ranging form Candela and Higueras (Coahuila), Sabinas, Bustamante, Codornices and Victoria, (Hidalgo) and in the North over Higueras (Coahuila), Rinconada, Monterrey-Monclova (Nuevo León) to Las Crucitas in the South in the State of Tamaulipas. Habitat and ecology: Coryphantha salinensis occurs in desert scrub. It grows in alluvial plains and limestone gravel at the foot of the eastern slopes of the Sierra Madre Oriental. Coryphantha salinensis apparently intergrades and is sympatric with Coryphantha diffidlis. There do not appear to be any significant threats to this species. 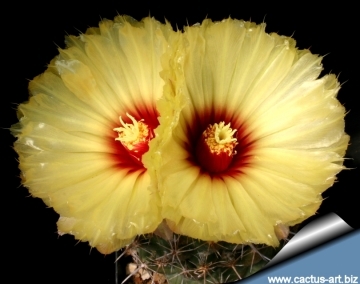 Description: Coryphantha salinensis is a globose-cylindrical cactus that pass several stages of development in which its appearance changes very much: after several years of purely radial spination one single porrect central, curved downwards, appears and with the appearance of the upper 2-3, slightly protruding centrals curved to the sides the plant develops two types of radial spines, lower radiant, stiff, horn-coloured and upper, whitish, thinner, flexible in a bundle. Derivation of specific name: “salinensis” for the occurrence near Salinas Victoria, Nuevo León, Mexico. Tubercles: In 8 and 13 series, conical, conical-cylindrical, roundish, in later years rhomboid basally and pyramidal, very firm, more or less erect, often imbricate and edges obliquely cut, width at the base 17 mm, length of upper surface 8 mm, of lower surface 18-22 mm long, with complete, in youth wooly groove. Axils conspicuously woolly in youth. Areoles: Round, 3 mm diameter, woolly in youth. Central spines: Usually 4, often absent on juveniles, straight to strongly curved, dull white to brown to black, 12-15 mm long, the lower one dominant, porrect, curved downwards like a horn, subulate, 15-21 mm long, all upper central spines thinner. Radial spines: 11-15(-20), equal at first, lower and later 5-7 spines unequal, stronger, firm, needle-like, straight, radiating, whitish with dark tips 10-15 mm long. upper 7-13 bundled, longer, 16-20 mm long, needle-like, straight, whitish with dark tips. 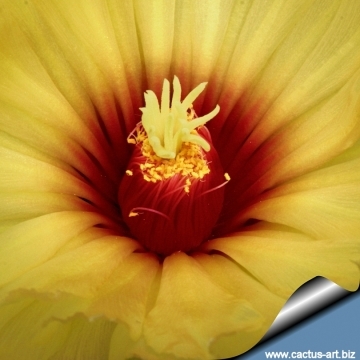 Flowers: Large ( 4-7 cm long, 4-7.5 cm in diameter) glossy yellow basally red, with greenish-brown dorsal midstripe, throat deep red, filaments red, anthers yellow, stigma whitish-yellow, lobes greenish-yellow. Fruits: Green, juicy 15-20 mm, 10 mm diameter with attached dried flower remnants. Seeds: Brown, reniform, 1.8 mm long, 1 mm wide. Notes: The outstanding feature of this species is an abrupt and contrasting change from the juvenile aspect with, flattened, white spines and a smooth appearance to the adult with additional, dark, protruding spines and a ‘fierce’ appearance. 5) Goettsch, B.K. 2013. 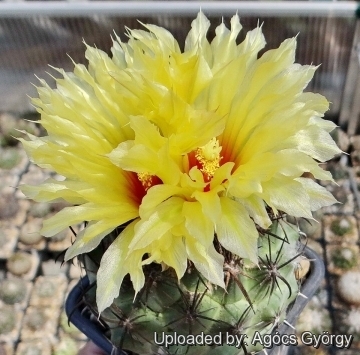 Coryphantha salinensis. The IUCN Red List of Threatened Species 2013: e.T152628A659137. http://dx.doi.org/10.2305/IUCN.UK.2013-2.RLTS.T152628A659137.en. Downloaded on 01 January 2016. 7) Heinrich Poselger "Beitrag zur Kakteenkunde". In: Allgemeine Gartenzeitung. 21(14): 106–107 1853. 8) Reto F. Dicht, Adrian D. Lüthy: "Feld wiederaufgefunden: Coryphantha salinensis (Poselger) Dicht & A. Lüthy comb. nov." In: Kakteen und andere Sukkulenten. 49(11): 257, 1998. 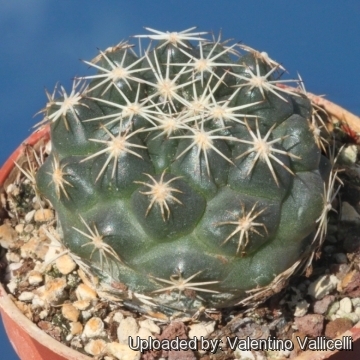 Cultivation and Propagation: Small growing and easy to to care in normal cactus compost and very willing to flower, Because of it’s small size makes a great potted plant specimen, great for beginning collectors, water sparingly and allow to dry between watering, needs good drainage. Watering should be curtailed during the winter months. Full sun but is tolerant and prefers light shade during the hot Summer months. And provide very good ventilation. Frost Tolerance: Hardy to - 5°C if kept dry..